Hundreds of people rimmed Crystal Lake in Northern Wisconsin on a hot afternoon. I stood along the shoreline with Noah Lottig from the North Temperate Lakes (NTL) LTER, watching the flocking gulls surround swimmers wading in and out of the sandy edge. The lake looked beautiful, clear and surrounded by dark green trees and patches of grass. The nearby campground has become so popular with locals and visitors alike that the sites book up almost a year in advance. While activity swirled above the surface, beneath the water an entirely new drama had unfolded. Historically, yellow perch, walleye, and small minnows formed the fish community in Crystal Lake. But, in the early 1980’s, anglers accidentally introduced cold water loving rainbow smelt into the lake. Oops. The smelt quickly outcompeted native species, drastically reducing the yellow perch and walleye population. norAs one of the seven study lakes of NTL, scientists wondered if there was anything they could do to reduce the smelt to manageable levels and promote a resurgence in native fish species. Three hours south of Crystal Lake, back at the University of Wisconsin-Madison campus, Dr. Emily Stanley, lead PI at NTL, pulled up a schematic on a computer from her office overlooking Lake Mendota. In most lake systems, there is distinct stratification of temperature, conductivity and dissolved oxygen every summer. Essentially, a warm upper layer of water “floats” on top of the lakes’ cold bottom layer. GELI mixes all the water layers of the lake without adding oxygen, raising the temperature of the lake body as a whole. Smelt don’t like warm water. The NTL team deployed GELI in Crystal Lake for the first time in 2014, and again in 2015. Tje experiment was a huge success as far as mixing the lake–there was no cold-water refuge for smelt at the bottom, just a lake full of seasonal warm water. However, when they sampled the water body in 2016 they were disappointed that the smelt still appeared in similar numbers as before. Did the mixing fail? Luckily, NTL had funding to continue their sampling efforts, and in 2017 they discovered a surprise: smelt numbers were down, and perch were up! Not only that – the growth rate of smelt had declined, while those of yellow perch had increased. Something was happening. In 2018, the surprises kept coming. Now bull catfish numbers had increased too! “We don’t know why,” Lottig explained, but he hopes future research can provide an explanation. If the smelt population stays down, Lottig also wants to reintroduce additional native species to both outcompete smelt in their niche, as well as eat the ones that remain. The result? At least a partial return of the fish community to its past diversity. As we surveyed the lake, a day-visitor came up to introduce himself, peppering Lottig with good-natured questions about the lake he loved, the natural landscape he had visited for over 50 years. 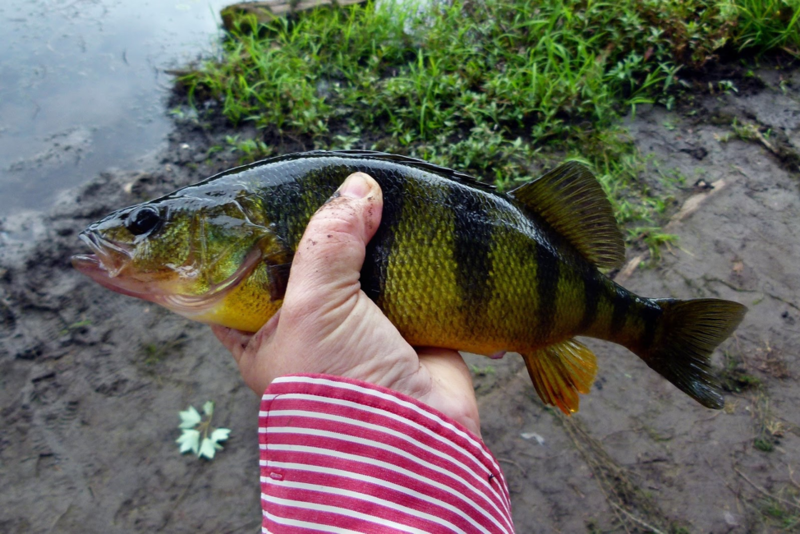 Lottig explained the experiment and the increased perch population, and the man looked visibly pleased.“I love fishing,” he said emphatically, clearly an angler. He reminded me that the restoration of native species is not only important for the ecosystem, but recreation and the economy as well.